Preliminary Assessment of a New Fission Fragments Heated Propulsion Concept and its Applicability to Manned Missions to the Planet Mars (Project 242)'', ASI Internal Report, Roma, 15 March 1999. Chen, W.L., et al. (2004) ''Is Chronic Radiation an Effective Prophylaxis against Cancer? '', Journal of American Physicians and Surgeons, Vol. 9, No. 1, pp. 6-10. Del Rossi, A., and Bruno, C. (2008) ''The Chernobyl Accident: A Detailed Account'', in: Nuclear Space Power and Propulsion Systems, edited by C. Bruno, AIAA Progress in Astronautics and Aeronautics, Vol. 225, AIAA, Reston, VA, App. B.
Dewar, J.A. (2002) ''The Story of the Nuclear Rocket: Lessons for the future'', IAC paper IAC-02-IAA.2.4.06, presented at the 53rd International Astronautical Congress—The World Space Congress, Oct. 10-19, 2002, Houston, TX, USA. Dewar, J.A. (2004) To the End of the Solar System: The Story of the Nuclear Rocket, University Press of Kentucky, Lexington, KY.
Galli, G., and Mancini, C. (1996) ''Esposizione alla Radioattivita Ambientale'', Ingegneria Nucleare e Tecnologie Energetiche, Vol. 38, No. 1-4. ICRP (1990) Publication 60, ''Recommendations of the International Commission on Radiological Protection''. Annals of the ICRP, Vol. 21, No. 1-3. Klein, H.A. (1988) The Science of Measurement: A Historical Survey, Dover, New York, Ch. 49. Lenard, R.X. (2008) ''Nuclear Safety: Legal Aspects and Policy Recommendations'', in: Nuclear Space Power and Propulsion Systems, edited by C. Bruno, AIAA Progress in Astronautics and Aeronautics, Vol. 225, AIAA, Reston, VA, Ch. 6. Mukhin, K.N. (1987) Physics of Atomic Nucleus, Vol. I, Mir Publishers, Moscow. Nature (2005) ''Chernobyl: Poverty and stress pose 'bigger threat' than radiation'', Nature, Vol. 437, September 8, 2005, 181. Petrangeli, G. (2006) Nuclear Safety, Butterworth-Heinemann, Oxford, UK, Appendices 3, 4 and 14. Powell, J., Maise, G., and Paniagua, J. (1998) ''MITEE: An Ultra Lightweight Nuclear Engine for New and Unique Planetary Science and Exploration Mission'', IAF paper IAF-98-R.1.01, presented at the 49th International Astronautical Congress, Sept. 28-Oct. 2, 1998, Melbourne, Australia. Powell, J., Maise, G., and Paniagua, J. (1999) ''The MITEE Family of Compact, Ultra Lightweight Nuclear Thermal Propulsion Engines for Planetary Space Exploration'', IAF paper IAF-99-5.6.03, presented at the 50th International Astronautical Congress, Oct. 4-8, 1999, Amsterdam, The Netherlands. 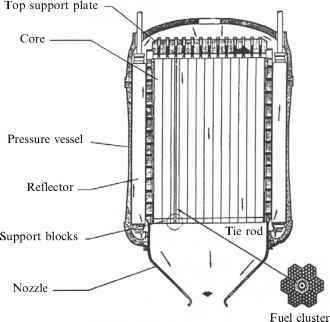 Rubbia, C. (2000) Fission Fragments Heating for Space Propulsion. European Organization for Nuclear Research (CERN), Geneva. UNSCEAR (1993) United Nations Scientific Committee on the Effects of Atomic Radiation, ''Sources and Effects of Ionizing Radiation'', Report to the General Assembly, with Scientific Annexes, United Nations, New York. UNSCEAR (2000) United Nations Scientific Committee on the Effects of Atomic Radiation, ''Sources and Effects of Ionizing Radiation'', Report to the General Assembly, with Scientific Annexes, United Nations, New York. UNSCEAR (2001) United Nations Scientific Committee on the Effects of Atomic Radiation, ''Hereditary Effects of Radiation'', Report to the General Assembly, with Scientific Annexes. United Nations, New York.